Flirting is enticing by one being of another by drawing attention through ordinary or subtle means. When done with mutual consent, it adds color to life. Life becomes meaningful, pleasurable; everything seems so right and harmonious. 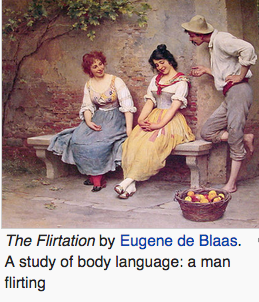 Flirting may include in the day to day living, an indication between two human beings or a group, out of which both drive lightness in mood and would like to remain in touch, just by being around. It may also be taken as love between two ( adult male and female ), individuals as long as there is an understanding of mutual sharing. It is common to see such gesticulation between two acquaintances. They may acknowledge the presence of the other by signals. Between students, there could be of drawing attention of others by cracking jokes and disturbing, but meaning to flirt. It is a social and sometimes sexual activity involving verbal or written communication as well as body language by one person to another, suggesting an interest in a deeper relationship with the other person. In most cultures, it is socially disapproved for a person to make explicitly sexual advances, but indirect or suggestive advances (i.e., flirting) may at times be considered acceptable. On the other hand, some people flirt playfully, for amusement. Flirting is popular TV theme and amusement all over the western and some other parts of the world. The shows usually get high TRP. While flirting and speaking or behaving in a way that suggests a mildly greater intimacy than the actual relationship between the parties would justify, though within the rules of social etiquette, which generally disapproves of a direct expression of sexual interest. This may be accomplished by communicating a sense of playfulness or irony. Double meaning words, with one meaning more formally appropriate and another more suggestive, may be used. Body language can include flicking the hair, eye contact, brief touching, open stances, proximity etc. Verbal communication of interest can include the vocal tone, such as pace, volume, intonation. Challenges (teasing, questions, qualifying, feigned disinterest) serve to increase tension, test intention, and congruity. Double meaning words, with one meaning more formally appropriate and another more suggestive, may be used. Body language can include flicking the hair, eye contact, brief touching, open stances, proximity etc. Verbal communication of interest can include the vocal tone, such as pace, volume, intonation. Challenges (teasing, questions, qualifying, feigned disinterest) serve to increase tension, test intention, and congruity. 1. In which a lot of playful exchange of words, and usually good mannered and humored teasing is carried out. In this, you always get on with conversation or remark on any action or deed of the other. 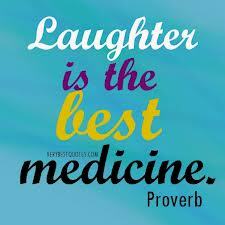 You are always trying to get humor out of any situation. 3. Casual touches; such as a woman gently touching a man’s arm during conversation. 4. Coyness, affectedly shy or modest, marked by cute, coquettish, or artful playfulness (e.g. pickup lines). 5. Eye contact, batting eyelashes, staring, winking, etc. 6. Flattery (regarding beauty, sexual attractiveness). 7. Footsie, a form of flirtation in which people use their feet to play with each other’s feet. Protean signals, such as touching one’s hair. 10. Sending notes, poems, or small gifts. 11.Singing specially selected love songs in the presence of the person. 12.Smiling suggestively. The effectiveness of these several interactions has been subjected to detailed analysis by online psychologists, and advice on their use is available from dating coaches. Here it may be appropriate that Anti-Flirt Club was formed in the USA in 1920 to caution and alert young ladies falling prey to men who just wanted have fun with no commitment. The Anti-Flirt Club was an American club active in Washington, D.C., during the early 1920s. The purpose of the club was to protect young women and girls who received unwelcome attention from men in automobiles and on street corners. 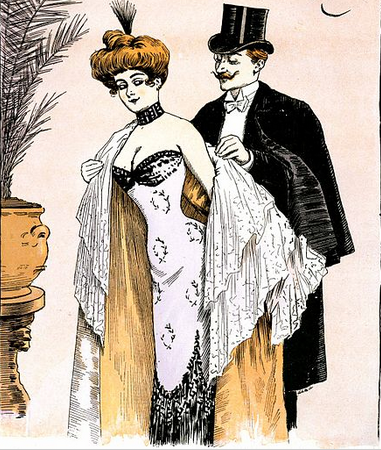 The Anti-Flirt Club launched an “Anti-Flirt” week, which began on March 4, 1923. ViaThe club had a series of rules, which were intended as sound and serious advice. Anti-flirt club Coquetry Enticing Flirt Footsie Giggling.